For Use On – Motorcycle windscreens, windshields, paint. Claimed Features – Bug remover. Will not remove wax. Drip resistant. Non-abrasive. 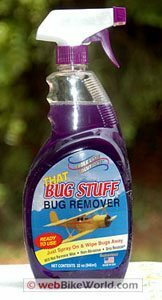 Here’s another apparent secret formula used by private pilots to clean bugs off the windscreens of their low-flying airplanes. 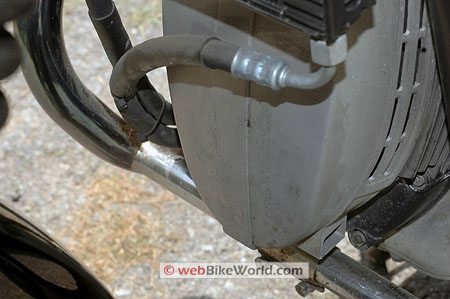 We gave it a try to see if it would work as well on motorcycle windscreens and fairings. Unfortunately, the perfect bug remover doesn’t exist yet, in our opinion. That would be some type of liquid that can be sprayed on and wiped off in a single swipe, completely removing every bug, bug carcass and the rest, while leaving a nice, shiny finish. 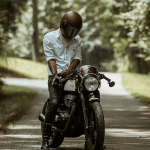 But it doesn’t really do anything more than would be expected from any other motorcycle cleaner or bug remover — the ‘screen gets wet and you can wipe the bugs off. The two photographs illustrate a before and after the use of That Bug Stuff, and it did a pretty decent job in this area. Again, the question to ask is “Compared to what?” when evaluating motorcycle cleaners, polishes and wax. In our opinion, That Bug Stuff doesn’t seem to work any better or worse than other types of general cleaners, such as Glass Plus or even good ‘ol soap and water. We give it a 2 out of 5 rating.